As we all know by now, there is a developing and coalescing body of new sports media critics. They exist almost exclusively online. Deadspin is their mothership. Bill Simmons is their Chuck Yeager, a old, cast-off pioneer. Dan Patrick is their surrogate father. Will Leitch is their aloof biological father. Jason Whitlock is an estranged uncle (by marriage, since divorced). Twitter is their bread and butter. Substantively, they are best defined by their enemies, the objects of their one-way scorn: ESPN, the NCAA, Roger Goodell, Skip Bayless, Chris Berman, Bleacher Report, Rick Reiley, Darren Rovell, Peter King, Gregg Easterbrook, Tim McCarver, Donald Trump, Ron Jaworski, Jay Mariotti, most Republicans, and, obviously, other people and institutions. Bayless is one of the most disliked figures in sports media today. After graduating from Vanderbilt in the 1970s, Skip eventually landed at The Dallas Morning News, one of the great sportswriting incubators of the newspaper era. (That last sentence was somewhat understated: the paper hired twenty-five-year-old Bayless to write its lead sports column and made him one of the highest paid sportswriters in the country.) What happened to him after that is unclear, but what everyone reading this knows is that Bayless has more recently reinvented his career by (largely) putting aside the pen, taking up the microphone, and beating Bill O’Reilly, Glen Beck, and (political) Keith Olbermann at the talking-head-lightning-rod game. I mention Skip’s background not necessarily because it should change what we think of Skip in all his First Take glory, but because most people– probably including twenty-four-year-old, Stanford educated, NFL all-pro Richard Sherman– don’t know it. 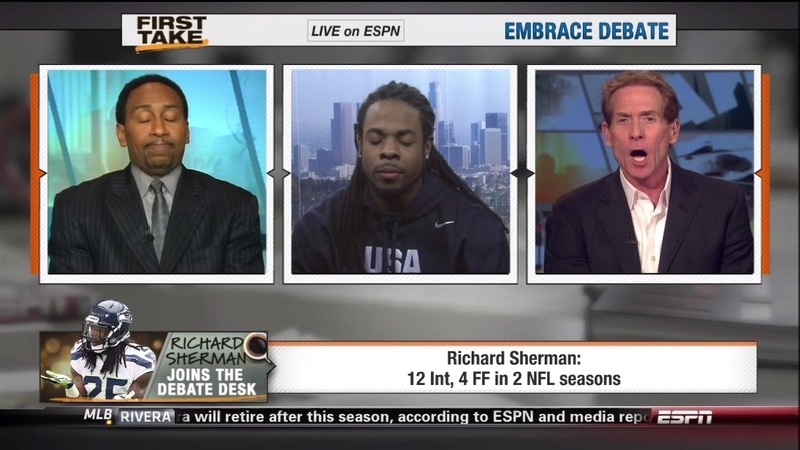 It’s no surprise, then, that when Sherman used his guest spot on First Take this week for the sole and explicit purpose of blasting Bayless, Deadspin et al. ate it up. (Video at that link.) Sherman is being hailed as a champion of the people, for taking the fight right to Skip’s door, for not mincing words and telling it like it is. Or at least that’s how you’d see it if you already had charted and codified your Skip Bayless story arc and were just plugging and playing new inputs at this point. The truth is that Sherman doesn’t look too good in this, really at all. I’m not saying that Skip’s schtick is defensible, intelligent, entertaining, or at all interesting. I am saying, though, that when Colin Cowherd’s take on something starts to sound like it’s making sense, you probably should take a step back and reevaluate your outlook. Many of the new sports media critics’ enemies have done things to open themselves to criticism– there are good reasons to critically assess what ESPN is doing with First Take— but I sense something less than desirable about the group’s pack mentality that can distort their view of the sports world. In this case, I think that group needs to ask itself whether it makes sense to celebrate someone who went on a daytime talk show with the sole purpose of ignoring the format and levying increasingly personal and irrational attacks on one of the hosts. If they conclude that it doesn’t, maybe they also should think about how they undertake their collective critical endeavor going forward. This entry was posted in ALDLAND and tagged colin cowherd, deadspin, espn, first take, media, richard sherman, skip bayless by AD. Bookmark the permalink. But seriously, the state of sports media isn’t flagging, right? This is what it’s come to. Sports media (and news for that matter too) care more about getting viewers, clicks, buzz, then they care about their credibility. And while I agree that Sherman didn’t “win” as much as he thinks he did, I could care less about Skip “winning” or getting a “grand slam”, when he and the others still say the inane crap they do, i.e. putting Tebow anywhere near the same tier as Montana, Brady, Manning, Aikman, et al. Give me sports news and info, not “shtick”. Completely agree with you, and I hope it was apparent that I didn’t agree with that part of Cowherd’s statement.